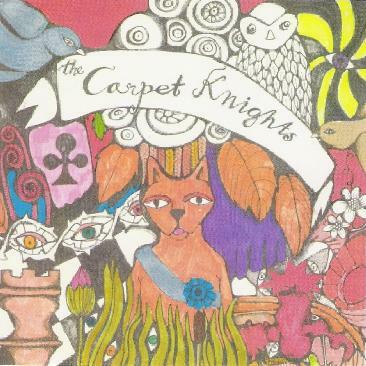 The Carpet Knights - "Lost And So Strange Is My Mind"
The Carpet Knights are a 70's inspired melodic rock band from Malmö. The band has been around since 1998 and has cut several demo CDs but this is their first full length CD for the Record Heaven sub label, Transubstans. It was recorded completely in their own home studio and the result is a pretty cool 70's sound, not a modern studio sound. The band spent a lot of time on the vocals as they play a very special place in this music, which is mostly groovy but sometimes psychedelic like on the short Zonked. The Mist has a very cool dark theme to it and I like the keyboard like sounding guitar in the middle break part that fades into the acoustic guitar. Fools and Silent Callers is one of the most Jethro Tull inspired tracks and a great one. The CD closes with the great nearly 11 minute track, Last of Many. An excellent debut. This is a very special CD and one that you have to hear a lot of times to finally get sucked into it. If you don't put in the effort with this record you will lose and never discover the magic they have created. For more information you can visit The Carpet Knights web site at: http://www.carpetknights.nu. Transubstans is a Record Heaven sub-label. Visit the Record Heaven web site at: http://www.recordheaven.net.